On the first Saturday of July, our town will host the annual 4th of July celebration. We have a unique advantage because the parade progresses down Main Street - directly in front of our house. Traditionally, we'll invite our friends and their lawn chairs over to collect candy and clap along with the Rinky-Dink Dancers from the next town over. Once the parade is finished, we'll head to the park across the street to sample deep-fried oreos, maple cotton candy, live local music and handmade crafts. The day will finish with fireworks over the Tioga River which we can watch from our front porch. On the other hand, all the years can run together. Without pictures to see how old the kids were or even how many we currently had, I can't rehearse specific details of each year. There was the scorching year that the fire trucks stopped every few feet to spray the kids with their giant hoses. I honestly can't remember if that was 4 or 5 years ago. Maybe it was even more! The daily monotony in the home can feel very similar. The days run together with another set of PB&J's made, more teeth brushed, and one more floor swept. The family photos on the wall mark a moment somewhere between the birth of that child and the present. I'm not always sure how much time has passed since that marker in time. The most encouraging thought of all - at this time last year, my baby girl was still in diapers! My own life reflects the growth that can't be seen on a daily basis. Sanctification is slow, hard, and monotonous. I feel no significant change when I wake up from one day to the next. I struggle with the same besetting sins and am reminded of the same spots of weakness. My spiritual life is more similar to the unhurried growth of an oak tree than the rapid sprouting of our backyard grass. It's barely visible most days. "The growth of trees and plants takes place so slowly that it is not easily seen. Daily we notice little change. But, in course of time, we see that a great change has taken place. So it is with grace. Sanctification is a progressive, lifelong work (Prov 4:18). It is an amazing work of God's grace and it is a work to be prayed for (Rom 8:27)." As time gradually passes, the Shepherd of my soul stays the same. It is His work, not mine that will ultimately conform me to His Son. I can take comfort in the repetition of habits (confession, prayer, Bible study, etc....) that change me even when I don't see it immediately. I can change only because He is constant. We have a little over a month until school starts up again. 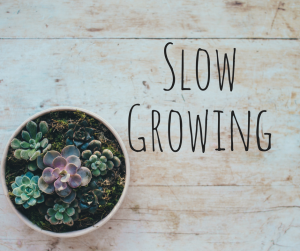 I plan to use that less structured time for investing in growth in grace even if I can't see the results until years later. I will be finishing my study of Exodus, taking some unplanned naps, travelling with my family, and enjoying Fourth of July fireworks, of course.